2 smoked mackerel fillets "TO FANARI"
Flake mackerel "TO FANARI" into chunks and set asisde. Crack eggs into a bowl, add creme fraiche, salt and pepper and beat until smooth. Melt butter in medium-heated frying pan. Pour in eggs, and very gently with a spatular or wooden spoon stir mixture around for a minute or two until eggs are scrambled. Remove from the heat while eggs are still a little runny, they will continue to cook in the pan shortly after. Scrambled eggs are best when soft and fluffy, not rubbery and overcooked. 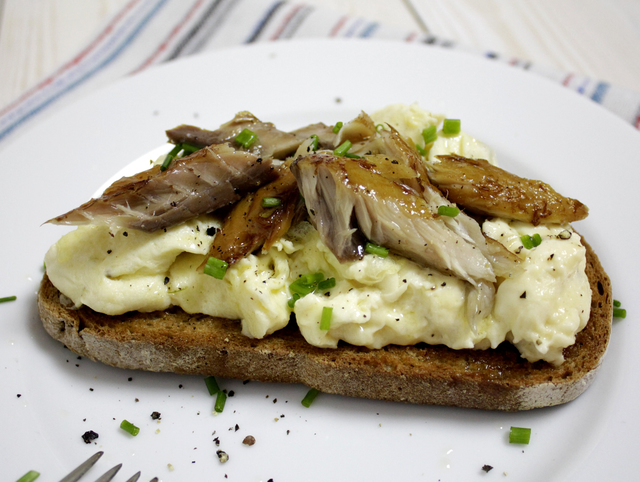 Butter your toast, top with creamy eggs, flaked mackerel "TO FANARI", chopped chives and a little melted butter.